What Does Christine Do When She Isn’t Writing? 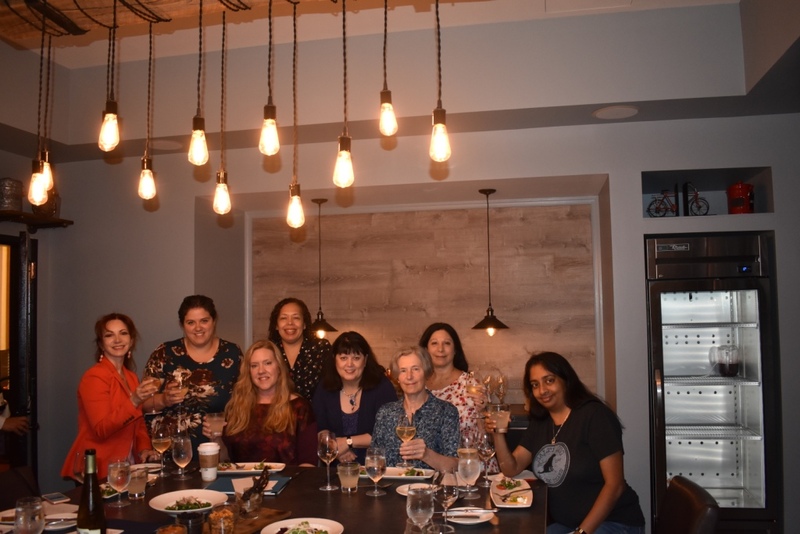 Photo: The Historical Novel Society Board food tasting at the Gaylord National Harbor. See the hard work this is? I’ve always believed in volunteering for conferences and other events that I know run on volunteer power. It’s not only a duty in my mind, but something magical seems to happen whenever I do it. I’ve met people who have become dear friends through volunteer work. I met my agent through volunteer work. And I’m excited to see what happens through my work with the Historical Novel Society-North America Conference, scheduled for June 20-22, 2019. I stumbled into this quite by accident. This biennial conference was held in Portland, Oregon, in June 2017. The conference moves from West Coast to East Coast to Midwest and back again. I jokingly observed to a board member that the conference should come to the Washington D.C. area in 2019, since it would be in my vicinity and I wouldn’t have to fly to the conference. Next thing I knew, I was the venue chair for the conference! We went through a rigorous property search and ended up contracting with the Gaylord National Harbor Resort and Convention Center, a really spectacular hotel. It had been a long time since I’d done anything like a hotel negotiation, so it was fun to dabble in it again. The board met at the Gaylord in June of this year for its pre-planning meeting, where the details of the conference begin to get hammered out. It was fascinating to watch (and participate in) the nitty-gritty of how a big event like this gets put together on pure volunteer power. I’ve already made new friends on the board and can hardly wait to see how the event unfolds next year. It’s definitely a lot of work, and I’m not sure I could do it long-term, given that Violet is already yelling at me about getting her next book wrapped up, but working on a writers’ conference is something I wouldn’t trade for the world. As an added bonus, there will be a Readers Festival during the conference, on June 22, 2019. The doors will be thrown open for readers to attend their own special sessions to meet their favorite authors, as well as having the opportunity to meet 120+ authors and purchase personalized books. I’ll have further details as we get closer to the date. If you live in the area, I hope you’ll mark the date for this huge event.